It is time to deck the halls again. Are you ready for the holiday season? If you findyourself lacking in Christmas decorations, head to The Christmas Warehouse - yourone-stop shop for baubles, ornaments, and festive décor. Nothing says Christmas ishere like a house covered with glowing lights, and sparkling ornaments. Take the timenow to dress up your home for the season's festivities, before the last-minute rush tofinish buying presents and getting organised for Christmas dinner. Looking for unique way to add a little sparkle around your home? Look no further!These Bauble Clusters are sure to stand out among your other Christmas decorations.These adorable and stylish ornaments are both traditional and modern, allowing them tofit into any holiday theme. In traditional red, gold and silver, or more modern purple andblue, these ornaments feature a number of different coloured baubles hung in a cluster,adorned with greenery and a bright ribbon. How can you use these shimmering clusters around your home during this year'sfestivities? 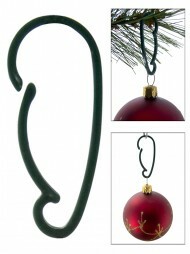 Skip the hassle of hanging dozens of individual ornaments on the tree -instead add a few of these for a pop of colour. 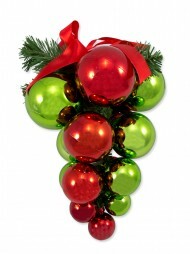 They can also make great focal pointswhen hung from the mantle, door, or chandelier. 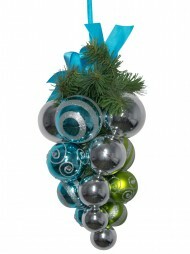 Any room in your home will lookdelightful with the addition of one or more of these Bauble Clusters. Beautiful and affordable to boot, these Christmas decorations are sure to be ahighlight at your home this holiday season. They also make lovely gifts for co-workers,neighbours, and your Secret Santa recipient. Purchase a few for your home and a fewfor your loved ones today at The Christmas Warehouse before they sell out.